What a gorgeous little children's quilt, designed by Gail Penberthy. 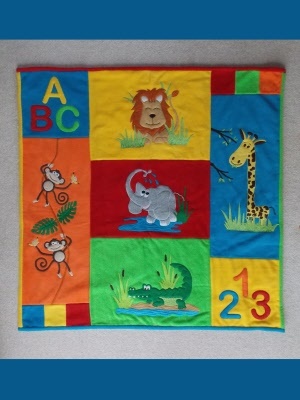 All of your favourite jungle animals in one quilt which has been made in fleece for extra cosiness. Using the bonded applique method, this is sure to bring a smile to any childs face and it is easy to make. The quilt measures approximately 45 x 45 inches.